Due to health reasons, this party has been canceled. It had been scheduled for July 5, 2007, from 3-5 p.m. at the Gregg Fellowship Hall. Click on the Play Button in the middle of the screen. It may take a few seconds to load. Fifteen teams did battle against themselves and against the course during the annual July 4th Golf Tournament held the day before the Independence Day holiday. When all scorecards were turned in, two rose to the top with identical rounds of 4-under par 31. That meant a playoff to determine this year's champions. Each year it seems as though a new and different playoff format is in place - just something to keep things a bit more interesting than simply struggling around nine challenging holes, trying your best to do your best. This year the format was one of alternating members of each team as the teed off, approached the green, and putted to the hole. This year it was the team of Francis Pike, Nelson Pike, Gerard Pike, Todd Ireland, and Brandon Brown facing off against the group of Aaron Morgan, Jeremy Morgan, John Rademaker, Tom Houseman, and Lisa Houseman for final bragging rights. empty space either. Two bogeys advanced the playoff to hole #2 and it's challenging 'pro' tee box set somewhere in the far distance of tangled grass and poison ivy (another new twist in the level of interest). Lisa again hit first for Team Morgan, reaching the fairway on the left. Todd put Team Pike in stronger position with another long drive, inside 100 yards along the right side of the fairway. Tom's second shot found the edge of the left trap, but not quite in, giving Aaron a chance to take his 'winter rules' club length back from the trap. 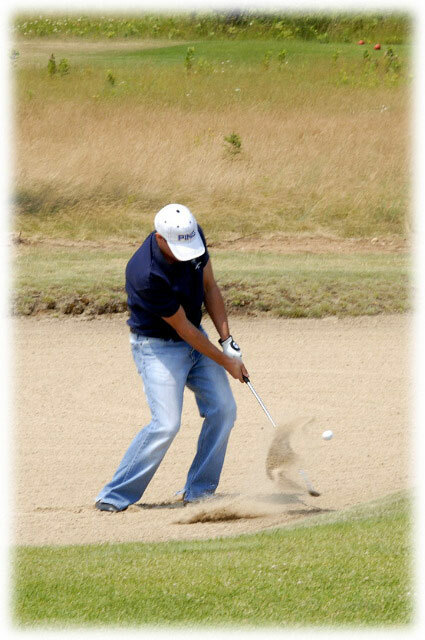 And while he got over the sand pit, his ball was high above the hole. Jeremy's putt took advantage of the downhill lie and rolled significantly past the hole. Meanwhile, Nelson putted up for Team Pike, leaving Francis with a 6-footer for par. John made a great attempt coming back up the hill for Team Morgan, but the miss left them with a double-bogey six, giving the Pike boys two tries to make the short putt. Although Francis' putt curved off the hole, it was simply a tap-in for the win. In all 32 business and individuals contributed to make this event another wonderful experience. Next up at the Beaver Island Golf Course is the Ladies Tournament on July 21. Call Annette (2542), Ruth (2582), Doris (2470), or Nel (2495) for information. 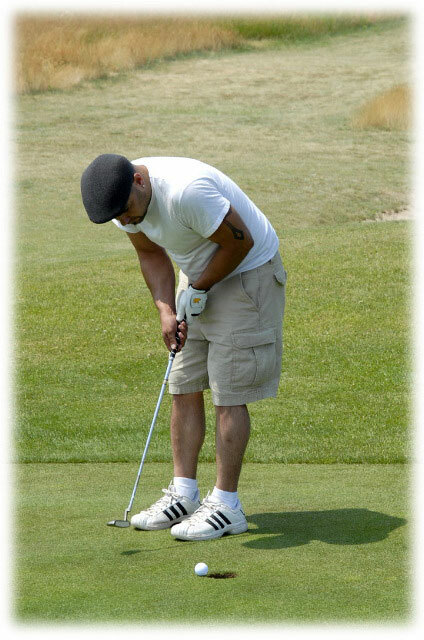 And mark your calendar for the 2nd Annual Jerry Sowa Golf Outing on August 3. Call Buck at 2680 to learn more. There was a lady who lived down by Fox Lake in the summer time. She had been a teacher at the Beaver Island Community School many years ago. I understand that she is now an archeologist, and brings groups of students to Beaver Island to study the 'mound builders.' She used to sing a song titled, "Beaver Island Blues." The chorus ended, "I've got the Beaver Island Blues, but NOT THAT BAD." What is this person's name? There were three people who responded with the correct answer: Kevin Green was first, Kathy Speck second, and Carol LaFreinere was third. The correct answer is Terry Bussy. This week it's another music question. What were the names of the four permanent members of the country rock group named "Rhythm Banned" that performed in the Shamrock Bar providing competition in the popular music market on Beaver Island in the 1980's? If you are the first to email me the correct answer, you may choose a person to receive a subscription to the Beaver Island News on the 'Net for the months of July, August, and September. Email me your answer to: medic5740@gmail.com. MOTION LoDico, second Morgan to approve the 5/9/2007 minutes, motion approved. MOTION LoDico, second Morgan to approve the payment of current bills, motion approved. Peaine Township has written a letter of support on behalf of the Beaver Island Rural Health Center for their application towards a USDA grant. John Fiegen gave a presentation on the Beaver Island School Bond Proposal for a 3.95 million dollar addition and improvements. A 25-year bond will be voted on in August 2007. MOTION LoDico, second Morgan to give Don Vyse, Beaver Island Airport Chairman, authorization to sign all necessary papers for the crack sealing on the airport runway, and to repaint the lines. J. Works reported on the phragmities DVD that was made and available for the public's viewing. The DVD's will be available to be picked up at the supervisor's office. John Works has applied for a USDA grant to purchase a $140,000 stump grinder for the brush that gets hauled to the Transfer Station brush pile. The grant will be for $77,000.00, and the Beaver Island Waste Management Fund will pay for the remainder of the cost. The current fee schedule is soon to be reviewed and revised for the Transfer Station. The deputy is requesting that a flashing 15 MPH speed light be installed in front of school, and the cost is to be divided up between the school and the two townships. PC Report: A Land Division request, Zoning ordinance amendments, and Airport Hangar site condo lots are being reviewed. To begin the festivities, the Community Choir , under the direction of Kathy Speck, will perform patriotic selections downtown near the Chamber office beginning at 1:00 p.m. The 4th of July Parade theme is: Water Woods Wonderland. Parade emcee Lisa Vance Gillespie asks that floats and other parade participants line up between noon and 1:30. The parade will kick off at 2:00 p.m. with the traditional “BOOM” of John Works Jr.'s replica Civil War cannon and proceed from Holy Cross Church. In case of rain the parade start will be delayed until 3 or 4 p.m. if necessary. Your Chamber of Commerce will sponsor Luther Kurtz and team from Skydive Beaver Island . They will Jump at 2:00 p.m. trailing red white and blue smoke and land at Drop Zone Beaver; the public beach. They will be at the Chamber of Commerce after the parade to answer questions about skydiving. At about 2:15 Paul Welke will lead a four plane flight from Island Airways . They will perform a missing man formation flyover. 4 th of July Carnival Event – Celebrity Dunkees! This year's 4 th of July Carnival will once again feature a dunk tank and some VIPs from Beaver Island! Principal Kitty McNamara will lead the line up of dunkees for the public to take a shot at dunking. Also Mariann Brown and some high school students have volunteered as well as a few choice community members! Come out and try your hand at dunking these celebs! There will be new games, too- Musical Stumps, Putt for a prize, Ring the bottle and Sheriff's reward. Many favorite games will return-Duck pond, Bean Bag Toss, Milk Bottle Toss, and more. Tickets will cost 50 cents each, games vary as to the number of tickets required to play. Also, face painting will available for those who wish to decorate themselves in honor of the 4 th of July! The Clyde Fogg Memorial Boat Parade begins at dusk on the harbor. Those wishing to qualify for the trophy should preregister with Lisa Vance-Gillespie at her shop or call her at 448-2888. The entry fee is $10 per boat and proceeds will go toward the fireworks fund. Fireworks over the harbor will follow the boat parade. Peaine and St. James Township both contribute for the fireworks, which are set off by members of the Beaver Island Fire Department. Holy Cross Hall on Sunday, July 1 for another AMVETS Pancake Breakfast . The meal will be served from 8:30 a.m. to noon. They will also be selling “Support Our Troops” hats for $5 each. 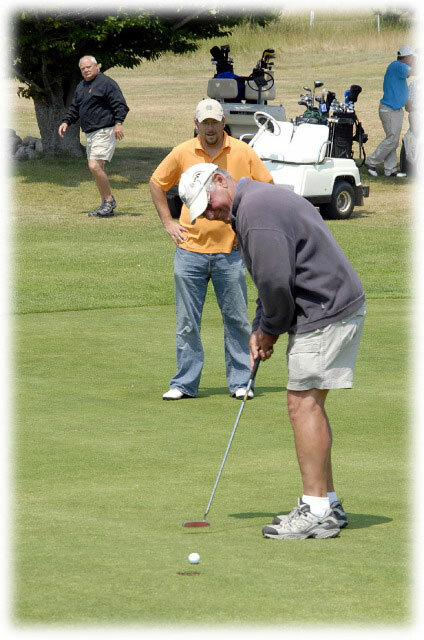 The annual golf tournament will be held at the Beaver Island Golf Course on July 3 at 9:00 a.m. 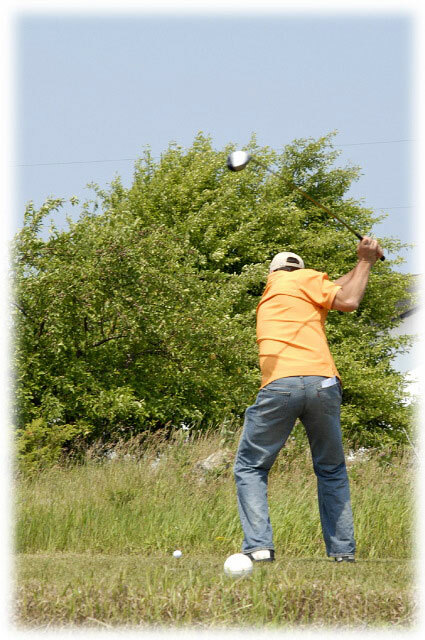 Entry fees ($43 for non members, $25 for members) Call: 448-2301 for more information. 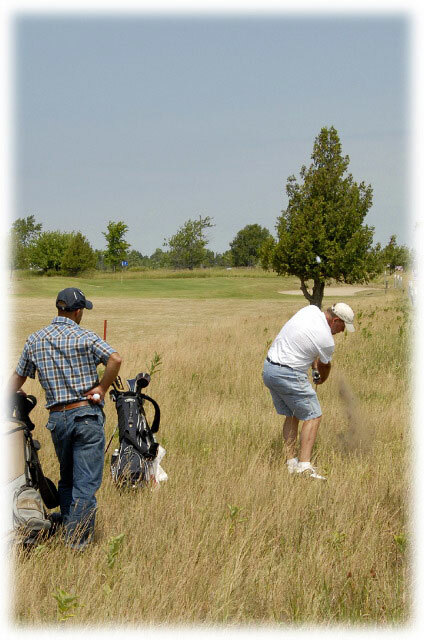 What is it that you do on Beaver Island to stay busy? Some silly person is fishing at the Coast Guard station and gets his waders full of water from the wake of power boats, trips, falls face first in the water, losing the big fish he was trying to land. At the top of the leader board again this week is the team of Ivan Young and Buck Ridgeway, followed closely by the team of Ron Wojan and Bob Simson in second, and the team of John Robert and Bill Hirschey in third place. 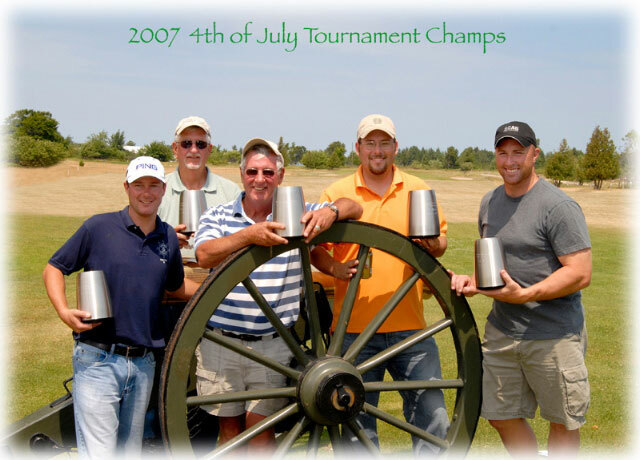 This coming Wednesday is the 4th of July, but the tournament will be on Tuesday, July 3rd, beginning at 9 a.m. The meeting was held on May 9, 2007, with members present including John Works, Jr, Christina Morgan, Pete LoDico, and members absent Paul Welke and Colleen Martin. Motion by Morgan, second LoDico to approve the 4-11-2007 minutes, motion approved. New Business included an Internet presentation by Brian Tort of Central Solutions, Inc. The towers that are needed on East Side Drive at the Fire Station would cost approximately ($60,000) and the EMS Fire Tower on Kings Highway by the old Peaine Township Hall. The Peaine Board directed the Planning Commission Chairman to expedite the tower ordinance. Chairman of the planning commission stated that they will need 30-60 days to amend the tower ordinance. Central Solutions stated that the total cost to provide service to the whole island would be close to $600,000 to be able to provide high speed Internet access. Motion LoDico, second Morgan to support tower construction at East Side Fire Station for Internet and emergency service use. financing and legal aspects to be looked into by John Works, Jr and Brian Tort, motion approved. Motion LoDico, second Morgan to approve Jean's Lawn Service contract for summer 2007, motion approved. Motion Morgan, second LoDico to write Letter of Support for grand request for Beaver Island Rural Health Center, motion approved.